So today was the first day of school for my kiddies. Our oldest started third grade and the twins started kindergarten. 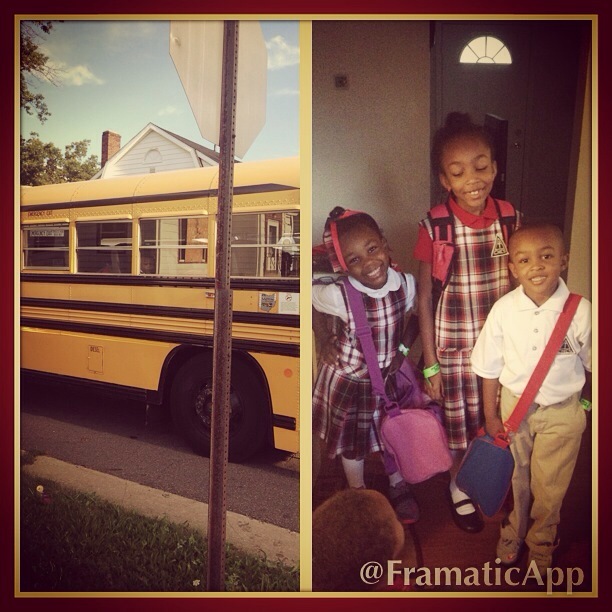 Of course this was a pivotal moment, we now have 3/4 kids in school and they are riding the bus! For some this may seem like a small thing but for me it was an inward battle. Yes, our kids riding the bus is more convenient. I don’t have to take them across town and be in horrible traffic. Yes, it’s a good experience with them all being together and having a sense if accomplishment. However, I battled thoughts/feelings if me being a bad mom. I am a SAHM and shouldn’t I be available to drop kids off and pick them up daily…what else do I have to do that’s more important? And then reality kicked in. I’m a great mom. Although my kids are riding the bus, I’m the one who walks and talks with them to and from the bus stop. I love them and they know it. Honestly this gives me somewhat of a break and frees me up to do more. I’m realizing that I can’t do everything and that’s okay. If something can be responsibly delegated that’s what I’ll do. If it can’t I’ll adjust. But the one thing that I’m taking from this is that I’m significant enough to do something that helps me be better…even in the smallest way.